The city's "green" schools are facing a peculiar problem regarding garbage segregation and disposal. 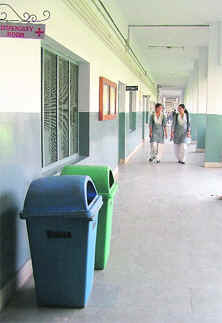 The municipal corporation’s garbage collection vehicle, schools say, collects the garbage that has been so vigilantly and religiously segregated into biodegradable and non-biodegradable categories by students, staff and school authorities and dumps it together as a combined heap into the rest of the trash. An act of daredevilry by a 23-year-old youth went horribly wrong when he ended up with over 60 per cent burn injuries. The victim, identified as Ajay Kumar, is struggling for his life at the burns unit in DMC Hospital here. Even as the Greater Ludhiana Area Development Authority finalised allotment of residential flats to 611 riot-affected families on Tuesday, a group of the beneficiaries has raised objections over the process of allotment. However, GLADA officials said the flats were allotted strictly as per the guidelines of the state government and norms laid down for this purpose. Despite its tall claims the municipal corporation of Ludhiana has failed to set up a solid waste treatment plant in the city till date. The file on the project appears to be gathering dust in state government departments with absolutely no progress being made. In a major reprieve for women suffering from domestic violence, “eve teasing” and other problems in their day-to-day life, police commissioner Ishwar Singh has decided to set up the city’s first police station exclusively for women. 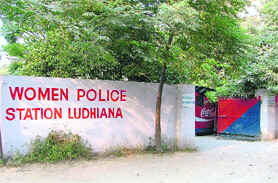 The move follows reports that many women were not filing police complaints just because of the reluctance to face a boorish male cop. Dandiya is the mesmerising poetry of human movements in tune with captivating rhythmic beats, intermittent jingling sound of bells and clattering of sticks with the electrifying flow of colours and lights in the backdrop. Come Navratras and not only the Gujarati community but the entire city is in the grip of dandia and garba fever. 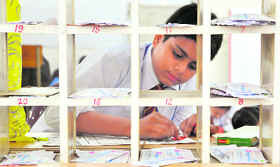 Maintaining that idle youths were soft targets for drug peddlers and anti-social elements, authorities in the Rural Self Employment Training Institute, Ludhiana, urged social leaders and elected members of civic bodies to motivate more unemployed rural youths to enhance their capacity by undertaking short-term professional courses being run by the institute. A magic show was organised for the primary wing students of BCM, Basant Avenue, Dugri. Magician Samrat created a thrilling aura which engrossed tiny kids and drove them into the magical world. The kids were mesmerised to see a bird coming out from a piece of cloth, papers turning to flowers and water pumping out of the ears of their fellow students. Seven per cent of all deaths worldwide each year are caused due to preventable lung diseases and they are the fourth biggest killers in India. Millions more people face a long and painful old age due to conditions that are treatable if diagnosed early through proper tests like spirometry, said Dr Akashdeep Singh, a senior consultant pulmonologist at SPS Apollo Hospitals, during a workshop on the eve of the World Spirometry Day. The outcome of the much publicised ‘fake bill’ scam case that rocked the municipal corporation in November 2009 still hangs in the balance with the state local bodies department failing to give clear-cut instructions either to the civic body or to the local police. Over 500 sportspersons formed a human chain and staged a protest against a spiritual programme to be held at Guru Nanak Stadium on November 12. The action committee formed by all the sports associations of the city also joined hands with the protesting players. 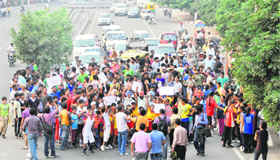 The players later marched towards Mata Rani Chowk near Jagraon bridge to mark their protest. Bangla beauty Indrani Das Gupta was today excited about the bridal look that was created on her at Lakme Beauty Salon. "The entire look defines the contemporary North Indian bride. It makes me feel special and captures the essence of my beauty," she said. To voice their anger against price rise, office-bearers and activists of the CPI and the CPM organised a joint conference at Chhappar village near here. The Punjab Kissan Sabha and trade unions, led by the Punjab School Teachers’ Union, besides the CPI and the CPI (M) announced to launch awareness marches in the area. Punjab Agricultural University (PAU) and HDFC Bank Limited entered into an accord by signing a memorandum of understanding (MoU) to promote cooperation and advancement of academic and business exchanges between the two organisations. Harkesh Singh Kehal has come up with his new book "Bhij gayee ruh mitra" in which he has described different seasons in Punjab. Four seasons — summer, winter, autumn and spring - have been viewed with different angles. Dr Jagir Singh Sidhu, former head and professor, genetics and biotechnology, PAU, released the book.